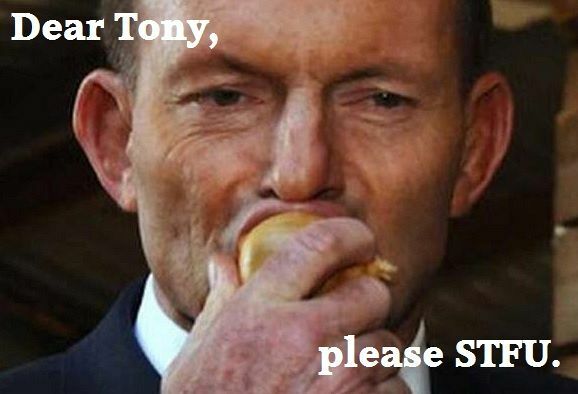 The best thing for the nation and all of us, says Michael Galvin, is for Tony Abbott to just keep his mouth shut. TONY, the day you lost your job three months ago was the happiest day of 2015 for me. I leapt for joy. I felt that Australia had dodged an enormous bullet. Not the bullet that might result from your “policies” (I can only use that word in inverted commas in regard to your prime ministership because your prejudices turned into government actions makes a mockery of the normal meaning of the word). Indeed, many of the manifold dangers in your “policies” have not been expunged yet, but that is now some-one else’s problem and not the point of this letter to you. What I found even worse than your “policies” was your feckless and dangerous incompetence. Hard to believe that you tried so hard to get troops on the ground in the Ukraine to protect dead bodies and aircraft wreckage. You were prepared for a real war with Russia over this? Evidently so, although it didn’t stop you koala-ing up to Putin a few months later. And from what you have been saying in recent weeks, we would now have been in an even bigger war in Iraq and Syria, a war that you have already described so disgustingly in “clash of civilisations” terms. If there had been a major natural disaster in your time, like a tsunami along the east coast, or a meteor strike in a major city, or a catastrophic bushfire, then God help us, because you showed that you don’t have the judgement or the basic competence required to deal with anything serious. But Tony, despite all this, I still thought you must have been a bit of a courageous bloke. At least you’ve got a bit of ticker, I thought, even if a screwed up brain. At least you get up every day and ride your bike like an Olympic athlete. Get out your surfboard and mix it with the young guys at Manly. Do your lifesaving bit in your red speedos, unashamed to display a middle aged hairy male body to all and sundry, in the cause of the great Aussie gods of sun and surf. And you eat onions the way lesser folks eat marshmallows. These are things I could never hope to do in a month of Sundays. Despite having more weird personality traits than a psychopath in a Stephen King novel, I knew I would not miss you when you were gone. Self-interest, really. Despite fascination with your weirdness, I preferred the feeling of safety that came from not having a lunatic in charge of the asylum anymore. At least politics could be managed on more rational terms. But no. In the last few weeks, you have risen from the dead, just like Uma Thurman breaking free of her coffin in Kill Bill 2. Like a zombie movie, you are coming back to life! The thought both terrifies and disgusts in equal measure. And this is why I need to write to you, Tony, before it is too late. I think I should tell you something before it gets too out of hand. You, Tony Abbott, are a coward. Yes, a coward. Even the ticker is as deficient as the head. Only a coward would carry on the way you have been in recent weeks, but only talk to your self-interested mates; blokes like Murray on Sky, or Jones on the radio, or Sheridan at the Oz, or the Thatcherite mob in London. You are obviously too scared to face a sceptical audience that you need to convince, or an interviewer who might ask you hard questions, or probe for deeper analysis. You, sir, are gutless. If you had the guts, you would now offer to be interviewed by a top-class journalist who did not already agree with you. And you would explain your position in regard to the Paris climate talks just ended. You would explain to the world, not just to an echo chamber of your mates, why coal is so good for humanity. And if you won’t, then just shut up and leave us in peace. It is embarrassing. People are already comparing you to Mark Latham, but this is unfair to him, not you. Latham will speak his mind to anyone, no matter how hostile. Not you, which is why you are gutless. Do the best thing for all of us and keep your mouth shut.